Place a pan over medium heat and add the olive oil. Sweat the red onions until soft and lightly caramelised, then add the garlic, spices and the chopped tomatoes. Remove from the heat and allow to cool completely. In a bowl, combine the lamb mince with the cooled spice tomato mix. Finely chop the mint and add to the mix along with the salt. Weigh out 60g balls of the mixture and shape onto a metal skewer into a sausage-shape about 10cm long. You should yield approximately 12 kofte. To make the dip, mix the sumac and yogurt. Finely chop the mint and add to the yogurt, stirring well to combine. Season with salt. 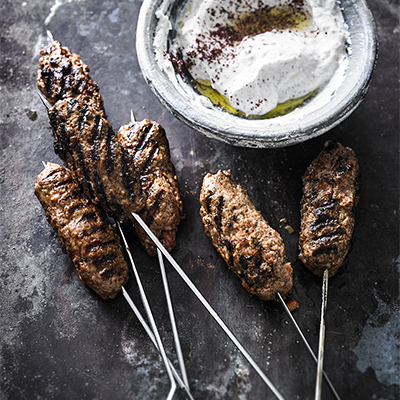 Cook the kofte on a preheated Fusion grill to a core temp of 60°c – and serve with the dip on the side.